With both the 12Z ETA and the 15Z RUC showing a good combination of CAPE and helicity in SE MO, along with a long-lived MCS being pushed that way by a decent mid-level jet, I decided a chase in that area was justified. I knew the dominant form of storms would be a fast-moving squall line, but hoped that with the good shear a few LEWPs might form and give me an outside shot at seeing a tornado - and if not, my chances of seeing a severe storm would be good. Within an hour of my departure around 1:20, I was in a severe thunderstorm watch that covered all of Missouri and Illinois south of the STL area, and the county I was in (Jefferson) and a number of others were in severe T-storm warnings. As it turns out, I saw neither a tornado nor a severe storm, but I did see an interesting isolated cell ahead of the main squall line just northeast of Cape Girardeau along the Perry-Cape Girardeau Co. line. This cell formed before 3 and looked mushy at first, but around 3:15 it started looking really good as I passed it to my east heading south on I-55 to try to get position on the main line in the flat, open country of the Missouri bootheel. As the isloated cell intensified, there was a dramatic overshoot, and I decided my chance of seeing something interesting was as good on this cell as anywhere - and besides I still had time as the main line remained well to the west. I exited just north of Cape Girardeau and backtracked north toward the cell on U.S. 61, north of Fruitland. I passed route C and stopped at a high spot somewhere around 3:30 (only way to see anything in this area) and watched the storm, which had a rock hard tower and was slighlty backsheared - a very good-looking storm. 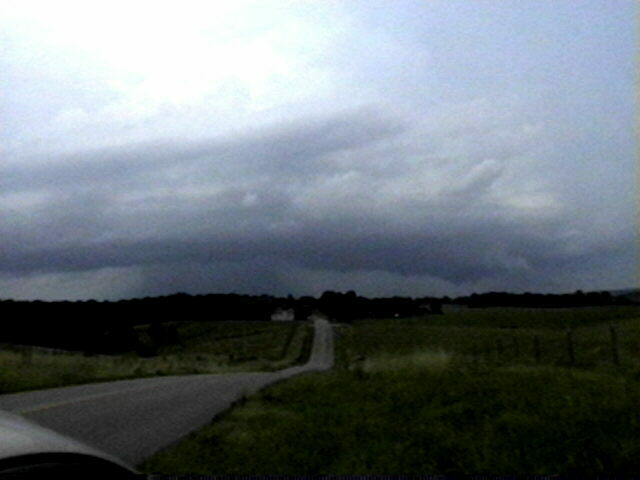 It produced some scuddy lowerings, then either a shelf cloud or inflow tail to my northeast about halfway to the ground. I backtracked to C and went northeast to get a better look. 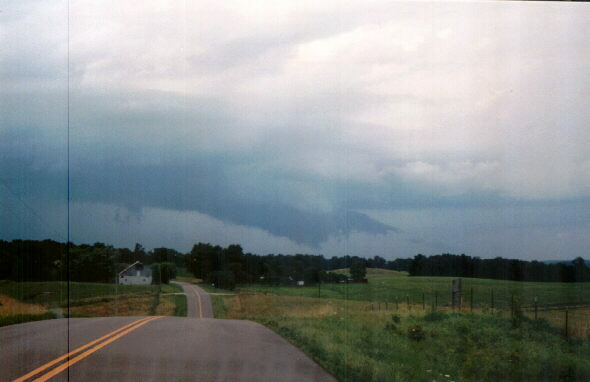 There were inflow fingers on the leading (SE) edge of the lowered area, then a scuddy lowering more than halfway to the ground. 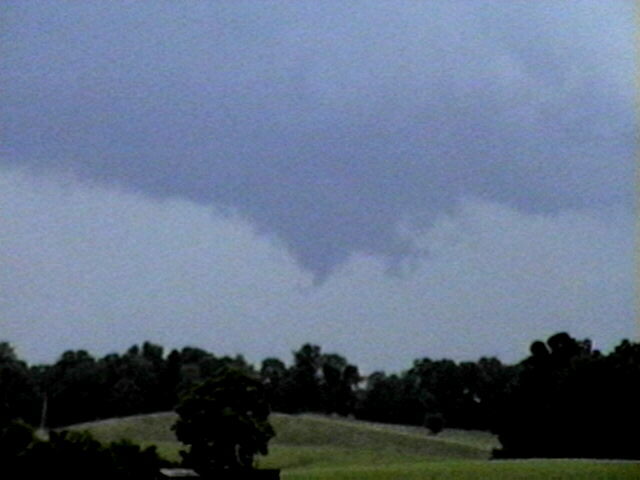 I could not see rotation either then or in my review of the video, but at the center it formed a narrow but very solid lowering that could have been either a needle funnel or a scud finger - I couldn't tell from that distance, even with the zoomed video, but would guess the latter since the overall lowering did not rotate. Some CG shot out of the RFB to the west of this feature. I watched this slow-moving storm until a little after 4:00. It looked like it was taking on supercell characteristics, but unfortunately, this storm was being rapidly overtaken by the fast-moving (40 mph) squall line to the west. 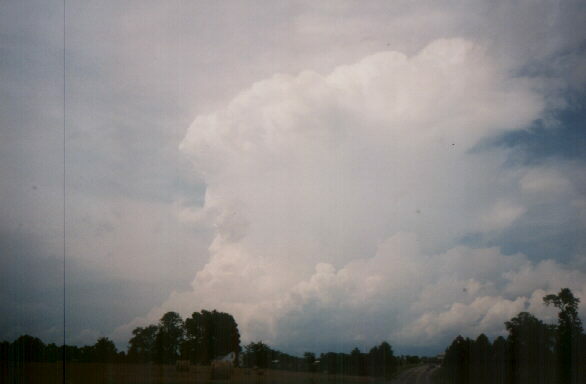 By around 4:00 the anvil of the western storm had overspread its top, and I could see it wasn't going to be able to get its act together before it was overtaken. Still hoping to see something interesting on the main line, I bailed south around 4:10 and tried to get to the flat area S. of Cape Girardeau ahead of the line. But its movement was too fast, and I was blasted first by wind then by rain (but no hail) as the line moved over. The rain was in a somewhat broken line behind the gust front, with the strongest wind ahead of the rain, as is common in storms in their later stages - and this one had been going since it developed the previous evening as a supercell in SE Wyoming! I was able to stay just behind the gust front to just S. of Sikeston. The one really interesting thing I saw was a large plume of smoke or dust - I'm not sure which - to my east just south of Sikeston. Whatever it was, it blew SE along the ground for quite a ways, then was drawn up almost to the cloud base by the inflow ahead of the gust front. But before long the rain overtook me and, at the same time, I was nearly out of gas - so the chase ended just south of Sikeston. Cape Girardeau Co. emergency management reported wind gusts around 45 mph, and this was consistent with what I saw - definitely below severe limits. I returned home via I-57 through Illinois, and as I got back to Edwardsville was treated to a spectacular sunset as the sun turned the bottom of anvil from storms to my west a bright red, and as new towers reached high into the sky to my north. Though they were 100 miles away, near Lincoln, they were brightly lit by the setting sun. Total chase distance - about 370 miles. Here are some storm reports from the squall line when it was farther to my west. By the time it reached the areas I was in, though, it had weakened below severe limits.